Rosi G. | Rosi does it all! I saw an earring holder one day on YouTube as I was trolling natural hair videos. I fell in love with it and wanted one but they were too much on Etsy! For example, here’s a 9″x12″ one on Etsy for $36 plus $10 shipping. Putting this together cannot be easier. Mark where you want your knobs and hook to go. Drill holes if you want or just screw in the knobs and hook. Cut the wooden dowels down to go across the back of the frame. Staple them down. VOILA! You’re done. 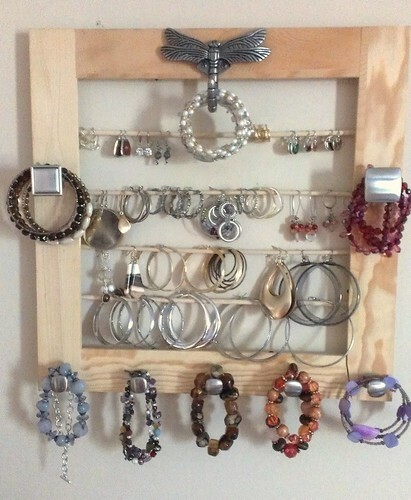 Hang your new earring holder on your wall (the frame should’ve brought a hanging thingie – that’s the technical term!! I SWEAR!). I left mine natural cuz I love this color and its the same color as my Ikea bedroom furniture. Feel free to have fun and paint it! Also note that I spent approx. $38 after bitching about how these are pricy on Etsy. LOL Once I got to the hardware store, these were the knobs and hook I liked so I ended up spending more. But, you could TOTALLY make this for WAY less by finding an old picture frame around your house and recycling it. There are also knobs available for $1. Here are some nice ones for $1.02 from Lowe’s. Are you guys bored? 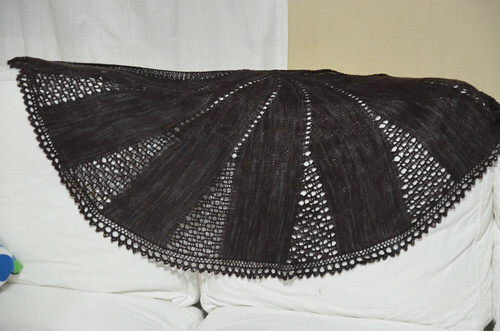 Cristi and I have released the first part of our Djinni Mystery Sock KAL! And here’s a button Cristi made for the occasion! Isn’t that a beautiful name? It just flows. I-sau-raaaa. 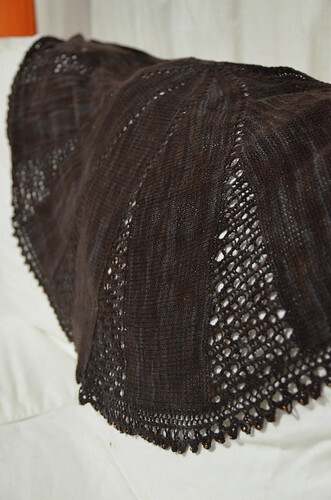 I’m in love with this shawl. 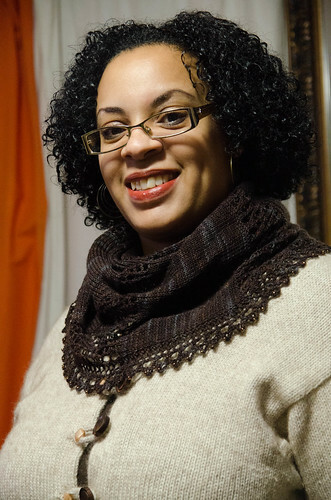 I have worn it over and over since I blocked it in January. I added little gold beads all along the edge. The yarn is absolutely scrumptious. It’s a dark brown with undertones of bluish gray. Awesome dye job. I’d never worked with Spirit Trail yarn before. Must. Repeat! I only had about a yard of yarn left when I was done. For a second there I was nervous that I’d have to rip back a row or two just to bind off! 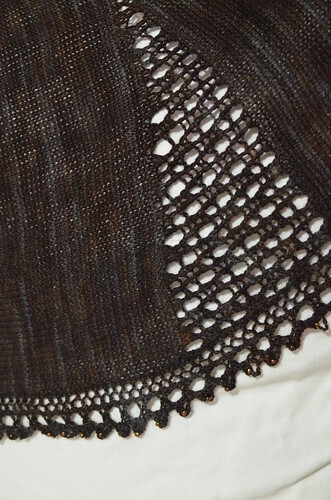 The pattern was very easy to follow, although I admit that at first I though the lace was wrong because it’s a staggered lace. But I went with it and love the result. 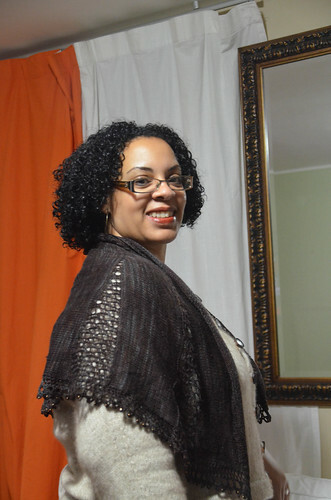 Can I tell you that I’ve wrapped this shawl a million different ways around my neck, tucked under my coat, twisted, etc. and when I shake it out, it still has the original shaped from when I blocked it? In fact, I took these pictures after wearing it half a dozen times. See how well the lace holds it’s shape? LOVE that. Cristi and I are working on a design together. It’s been a blast so far. Stay tuned for more deets!! !